NOTE: Couplers for all compatible loggers are included with the BASE-U-4. 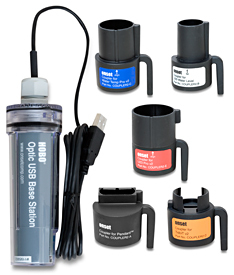 Couplers are included for compatibility with six of our most popular logger types including: UA Pendants, U20 water level loggers, the U22 Water Temp Pro v2, our UTBI TidbiT, U24 Conductivity and U23 loggers. Operating temperatures range of 0 to 50°C (32 to 122°F).